The workshop, opened on via dei Piatti in Milan in 1967, became the prototype of the modern boutique. 15 people worked there. Over time by virtue of high quality of production and commercial intuition of the managers the company has turned into one of the most famous and commercially successful jewelry brands Pomellato. Pomellato style is easy to recognize — it's svelte, original and laconic design, massive gold and gross multicolored semiprecious stones (tourmaline, aquamarine, ijolite, topaz, amethyst, garnet, peridot). Pomellato creates about 80 new models every year and the bestsellers of the previous years belong to so called «traditional collection». Having been born in the epoch of social changes in Europe and following after them democratization of luxury, Pomellato is proud of its prкt-a-porter status in jewelry art. In honor of its 40th anniversary the brand has created the special present for the faithful clients and has made haute couture collection. 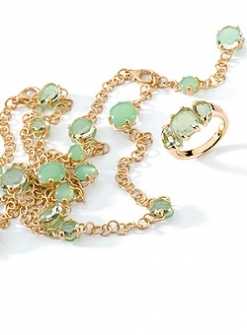 This collection meets Pomellato style requirements. 25 exclusive rings emblaze the beauty of semiprecious stones. Creating the design of the rings the jewelers took into consideration the uniqueness of every stone. «Flat brilliants» are used as framing. Through the transparent surface of the brilliants you can see the concealed rear side of the stone. The company has used large sapphires, emeralds and rubies in the jewelry articles for the first time. The ring with the huge brilliant crowns the collection.